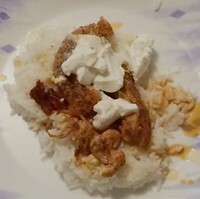 I was looking for a one skillet recipe and came across this one for creamy chipotle chicken when using the one skillet filter in my Living Cookbook database. It’s not quite one skillet, though, because you really need to serve it with rice, but it was easy enough. It turned out quite well. As always I replaced the onion with minced onion. I was careful with the chipotle pepper and adobo sauce; I have a tendency to overdo it with those ingredients. The end result was quite delicious. Terry certainly loved it.